Adapter Board is the dedicated interface to connect the PED-Board to the specific hardware application. Usually realized as a two or four layers board, it host mainly connectors and dedicated ICs, resulting in a very inexpensive PCB. Everyone can design and build its own Adapter Board taking into account the design guidelines reported in the download section. 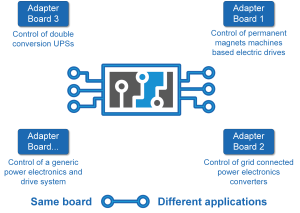 However, if you need help to design and build your own Adapter Board according to your specifications, even for low to high volume production, please email us support@ped-board.com. Some Adapter Boards ready to be used, assembled and tested can be ordered directly from the PED-Board web site. Can be connected directly to the High-Voltage Sensing Board (HVSB) for DC and AC voltage measurement with isolation. Applications: motor control, multilevel topologies, grid- tied and stand alone power converters, power quality analysis and power monitoring. Fully isolated DC and AC sensing board for high-voltage measurements (up to 1kV) with true differential output: 3 independent channels. Dedicated Adapter Board for Semikron Skiip3 six-pack intelligent power modules. On-board power supply for the Skiip system. Usable with HVSB for additional isolated voltage measurement. Resolver port. Up to 3 external measures with integrated +15V/-15V power supply. Encoder interface. A dedicated board having the specific features that cover the requirements of the PED applications for university, industry and research centers.